Ask Tiffany: Can I Charge Full Fee and *still* do Long Term Work? As part of our ongoing money series, I am answering YOUR questions about money and private practice. It’s a great question and one I’m absolutely certain many of you have! 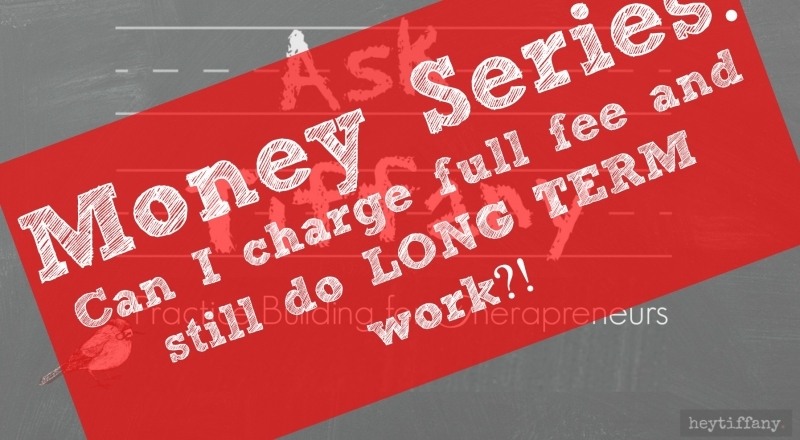 Check out the latest episode of Ask Tiffany: The Money Series for Therapists in Private Practice, to hear how long you can expect full fee clients to stick around! Whooftah! This episode gotchyer wheels TURNIN’! Now I’d love to hear from YOU. Is it really possible to have full fee clients who are willing to invest in long term psychotherapy?! Jump down to the comments section and share YOUR thoughts with the community. Tell it to us straight Tiffany! So true…I have some inner work to do…a few stones left unturned..I realize that I am not 100% behind the value that I offer. Thank you! AMEN, Tressa! Get IN there. Get behind that offer. What would it take for you to feel extremely clear that what you are offering is worth the price you *need* to charge to be in line with your financial integrity? Get out there, BOLDLY. If you can reach even just a few of your ideal clients and really find out if they want what you are offering (how would you know? If they happily and willingly pay your full fee), then you just need to keep doing that. If you are out there boldly and you are getting crickets, it means you need to work on sharpening up your marketing message and making sure that what you are offering and the words you are using to describe it resonate deeply with your peeps.